STRESS MANAGEMENT IS ONE OF THOSE THINGS THAT EVERYONE SEEMS TO HAVE A DIFFERENT OPINION ABOUT. There are even people who have built entire careers based on telling people how they should manage stress effectively. Stress management is one of those things that I’ve always taken a person interest in because at one point in my life I went from being completely stress-free to being crippled by it. Reading about stress management methods can be as stress-inducing as whatever it is that is making you stressed out in the first place. So I sat down and put together a list of effective stress management theories based on other techniques and tools I have studied. I can tell you that the list was originally a lot longer than 5 key things, but then I got to thinking, “which of these principles are the most important?” Like reducing all those methods down to their lowest common denominators. WHEN IT COMES TO EFECTIVELY MANAGING THE STRESS THAT WE ARE ALL NO-DOUBT SURE TO ENCOUNTER IN OUR LIVES, HERE ARE 5 TIPS THAT CAN KEEP YOU FROM GETTING BURIED. 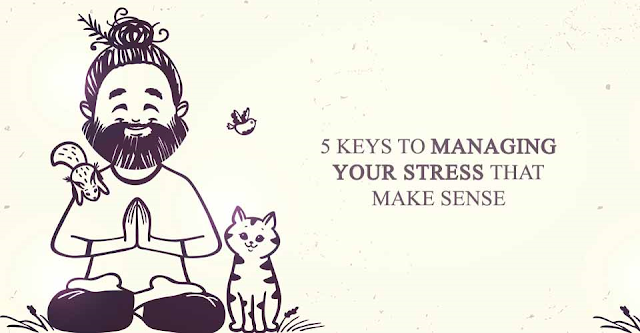 First and foremost, just like with anything else you are facing in life, simply accepting the fact that you are stressed out is the first step to managing it. Trust me, I know how simple that sounds, but that doesn’t make it any less true or important. Sometimes we just to need to accept the fact that stress is going to be a part of our lives at some point, and that we are stressed out when we are. Ignoring it or blowing it off is the first step to letting stress sneak up on you on overwhelm you. Every situation in life has at least two sides to it. Your perspective defines your reality, so maintaining and ACCURATE perspective on your stress is crucial to managing it. I emphasize the word accurate because if you let your perspective be shifted by overly emotional responses, you can easily blow your realistic stress levels out of the water. This is one thing that I personally am terrible at. I completely admit that. The reason that time management is so important to me for stress management is the fact that wasting time can make stress even worse. If you know you have a dozen things to get done, and you get hung up on something unrelated and time consuming, you stress out even more about your “to do” list because you now have less time to finish it. Again, just like maintaining perspective, maintaining a certain balance in your life is a key to stress management. Things like finding an effective balance between time with others and time for yourself, balancing activity and rest, up and down time – all factor in to not letting stress swamp your life. letting aspects of your life get out of balance affects other aspects of your life you wouldn’t even consider, including stress levels. Last, and certainly far from the least is Attitude. For me, attitude is the key to just about everything in life. Maintaining a positive attitude in the face of stress can be the most difficult aspect of managing stress, but I can assure you it is the most effective.